Seriously, MASQUE is one of my favorite covers of recent months. I love how dreamy it is–in sort of a creepy nightmarish way which totally fits the book– and the color scheme, and how the girl’s face is completely obscured by the umbrella. So, MASQUE is a steampunk post-apocalyptic Victorian retelling of Poe’s MASQUE—um, hello, how amazing is THAT? The prose in this book is gorgeous, and the setting is vivid in a dark, dreamy-dreary way, as befitting a world that has been devastated by plague and a heroine who experiences everything through a haze in an effort to forget the past that haunts her. If you’ve read many of my other reviews, you’ll know that I’m a sucker for a broken, flawed heroine, so Araby grabbed me right away with her damaged soul and her exploits at the Debauchery Club. In Araby’s city, the wealthy wear masks to avoid contamination while corpse collectors make regular rounds to collect the bodies of the less fortunate. I really loved the disconnect between that pervasive sense of despair and the sensuous, ridiculously expensive parties that the rich use as an escape. The two love interests in MASQUE–Will and Elliott–are so, so different and both have their own secrets to keep. To me, Elliott is one of the most fascinating characters I’ve read about in a long time, and I seriously can’t wait to see what the next book holds in store for him and Araby. Now, it’s GIVEAWAY TIME! 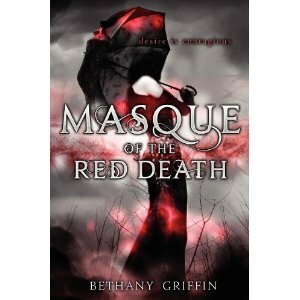 To win a shiny new copy of Bethany’s MASQUE OF THE RED DEATH, leave your best Poe pun in the comments by Tuesday, May 1st, noon PST (or, you know, just comment) Winner will be chose by random–Good luck! Okay, honestly, I couldn’t make a Poe Pun if you held a gun to my head because I’m not familiar enough with his works, but i SO DESPERATELY WANT THIS BOOK BECAUSE I’M SURE I WILL LOVE THIS STORY EVEN IF I’D NEVER HEARD THE NAME POE IN MY LIFE! Bethany is so SO talented and honestly, if I don’t win, i will not be broken hearted because i will be purchasing a copy for myself. MUST. OWN. THIS. BOOK. Darn, can’t think of a Poe pun! I haven’t read much of him But I so, so, SO want to read this book! It sounds SO GREAT and I’m in desperate need to read something like that. I can’t think of a Poe pun right now. But I’ve been seeing so many good things about this novel on a bunch of blogs, and I can’t wait to read it. Pff, okay, that was lame. SORRY! But my ‘pun’ skills are NOT in their ‘punier’ moment. Though, Edgar Alan Poe? This book already has my attention!! I was trying really hard to think of a Poe pun but the best I could come up with were so bad I don’t even want to share it. Let’s just say it was a bad play on a heart beating and it being tell-tale…yeah. Anyway. This book has been getting some great reviews and it sounds so, so good…plus, the cover is gorgeous! I really really REALLY want to read this book. Not only is the cover extremely gorgeous but it seems like MY kind of book. Hmmm…can’t really think of any good Poe puns. BUT being that my name is Raven (besides the That’s So Raven jokes) people do always saying Nevermore which is kinda cool since my last name is actually Moore and if you write my first name backwards you get Nevar (which is kind of like ‘never) so..I’m Nevarmoore. Ahhhh…my pun skills are less than stellar. Too terrible to post. Just imagine never over and over again. 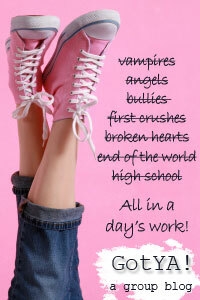 I absolutely love this cover!! !